Sikkim Democratic Front party has paid rich tribute to the former Prime Minister of India Atal Bihari Vajpayee on Friday. The ruling party has expressed its heartfelt condolences on the sad demise of the great leader Bharat Ratna Atal Bihari Vajpayee and prayed for peace to the departed soul. In a condolence meeting here on Friday, the SDF has remembered the close relationship of the former Prime Minister with Sikkim. The meeting also observed two minutes silence as a mark of respect to the departed soul. SDF spokesperson Bhim Dahal said Bharat Ratna Atal Bihari Vajpayee was a great visionary leader. He also mentioned about the close relationship of the former PM with Sikkim and the Chief Minister Pawan Chamling. “Atal Bihari Vajpayee was very close to Sikkim and our leader Pawan Chamling. He visited Sikkim during his tenure as Prime Minister and he was always concerned and sensitive towards the demands, progress and development of Sikkim,” Dahal said. Another SDF spokesperson KT Gyaltsen said the nation has lost a great son and visionary leader and his demise is the end of an era. Gyaltsen said it is important to respect and follow his vision, ideology and principles. SDF general secretary (press & publicity) Kavita Subba said Late Vajpayee was a great icon of Raj Dharma and the nation has lost a great poet, leader and personality. 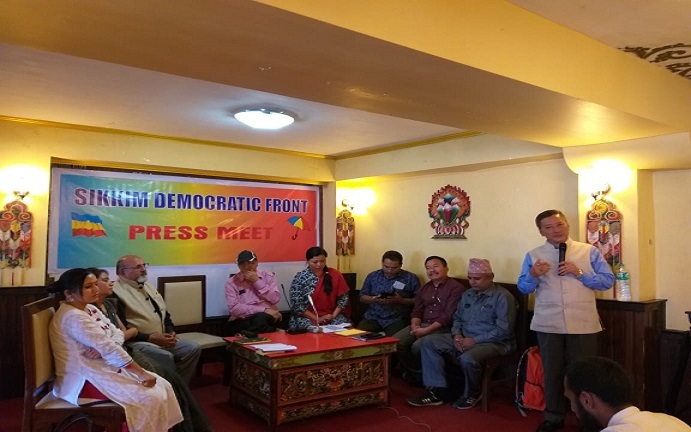 SDF publicity secretary, Krishna Kharel said people of Sikkim will always remember the former PM for his concern towards the state. He said Sikkim has made significant achievements during his tenure as PM. Press Club of Sikkim president, Joseph Lepcha also condoled the sad demise of Atal Bihari Vajpayee. He added that the nation and the society would always remember his works and contributions. While sharing his personal meeting with the former PM during his Sikkim visit in 2003, Lepcha stated that former PM was like a friend to Sikkim. Senior journalist Padam Chettri also spoke about the life of Late Atal Bihari Vajpayee. Journalist Prabin Khaling recited a poem of Atal Bihari Vajpayee translated in Nepali.